No depth data and it still has a few BUGS as it is still testing code . it is part of a larger project called " space-nerds in space" . You mean this gas giant texture generator? I am the author of gaseous-giganticus, and of space-nerds-in-space. If you have any questions, I can try to answer them. As for animating... yes and no. Yes it will animate, but: 1) it takes a ton of CPU to do so. 2) There is a sweet spot when things look good in the sequence. In the beginning, things are all fuzzy and boring, then after a while things sharpen up and it begins to look interesting, and then after awhile it just starts getting weird looking. So, animating while a neat trick, probably isn't really practical. Edit to add: BTW you can speed up the rendering in a couple of ways. 1) the -F option allows you to use a smaller velocity field. By default it is 2048x2048, but using 512x512 or even 256x256 gives you plausible looking results -- may be useful to fine tune other params in a hurry before doing a final run with big velocity field. and 2) the -d option will dump out a calculated velocity field, and the -r option wil restore a previously dumped velocity field, so you can re-use a velocity field with different input images and save the 200 seconds or whatever that it requires to calculate the six 2048x2048 velocity fields on subsequent runs. Granted, these don't get you to real time, and a GPU implementation of all this would be cool, but is beyond my abilities. It only "works in 3d volumetric space" because a sphere is a 3D shape. There is no depth (altitude) to the clouds at all. It's all a bunch of particles moving around strictly confined to the *surface* of a sphere, on rails defined by 6 2048x2048 velocity fields that are confined to the surface of a sphere. The particles leave corresponding alpha-blended trails on 6 square images that form a cubemap. It is not in any way a simulation, it is just an arbitrary process that happens to produce something which from a sufficient distance kind of looks like it could plausibly be a gas giant. stephenmcameron, hi, thank you for explanation! That idea I want to use is also based on the velocity filed, but move not a particles, but morph a texture. This can be done in a real-time at rendering stage. To fix the too strong distortion at the end of the animation cycle, the morphed texture stars to blend into the new non-morphed, and the cycle repeats. The initial textures can be generated using any procedural method (or even be a real textures of Jupiter for example). That looks amazing. Too bad you'd need a supercomputer to run it. You may want to take a look at this. Someone has implemented the heart of this algorithm on the GPU. 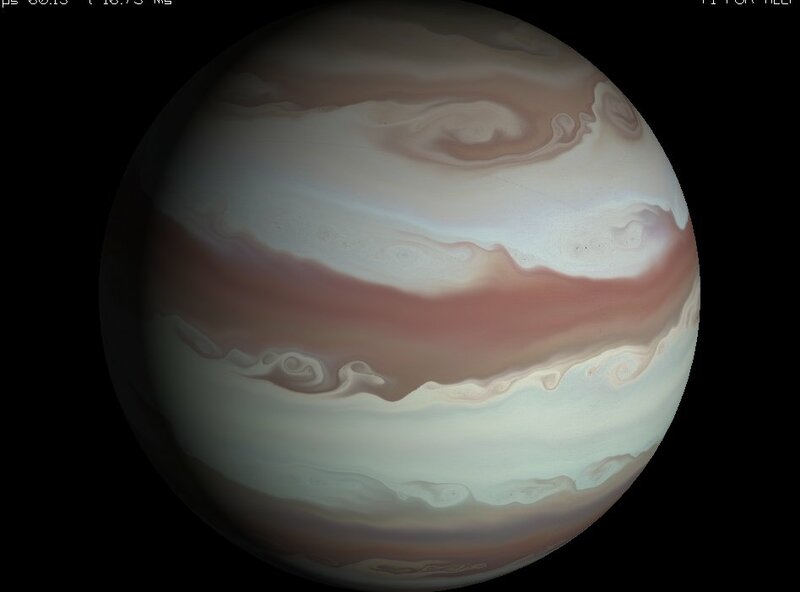 When creating the procedural generation of gas giant surface textures, would the chemical composition and thermal variation of gas giant clouds be factored in the procedural generation? No, this is purely a graphics hack. You could choose colors to correspond to some realistic chemicals I suppose, but, there's no real fluid dynamics sim here, this is just a graphics technique that gets a bit of that characteristic look of fluid dynamics cheaply. Someone made even more impressive implementation. Unfortunately there are very little information about this work. Oh my god this is incredible, I hope they will add the animation for the next version!